About - CONNECT WITH YOUR FOOD AND YOUR FARMERS! ​We are grateful to be tending a beautiful circa 1800 eighty-acre farm in Robeson Township in the southern tip of Berks County. The gently rolling pastures and tillable land marry perfectly with the farm's forest, just a stone's throw from French Creek State Park. This farm has been cherished for years by our landlords and their support has given a lift to our wings. We know we feel best eating fresh, delicious food grown with dedication and our goal is to share that experience with our community of members. Being connected to the soil that produces our nourishment has changed our lives for the better and we think this rootedness is a universally good thing. 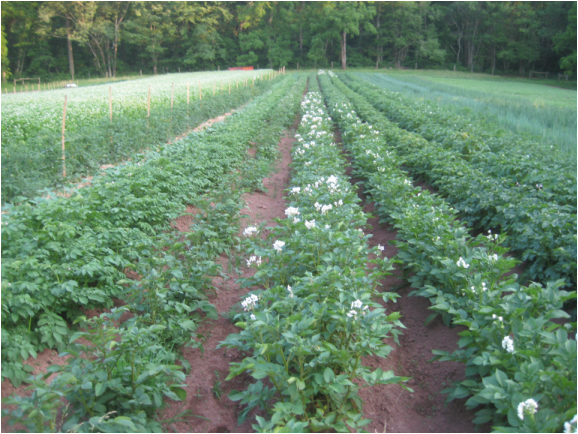 Broad Wing Farm grows less than 2 acres of vegetables and herbs. Small is beautiful and this scale allows us to attend to details and quality. We are currently Certified Naturally Grown, following organic standards but inspected by our fellow farmers instead of the USDA. We grow cover crops to protect and nourish the soil and rotate crops to avoid depleting the soil and building up pest pressure. We use natural fertilizers and manage pests, weeds and disease without synthetic chemicals as we constantly work to balance minerals in our soil, build organic matter, and increase soil health. We do not grow any genetically modified (GMO) crops. Visit us and see how we grow! We are glad to discuss our practices and look forward to developing relationships with those who enjoy our produce.